Adds a reactor made with Iskallium and Steel Casing. You find Iskallium Ore generated in the world. Mining it yields Iskallium Essence. The essence is used to craft Iskallium Blocks, as well as Steel casing, Iskallium Glass, Reactor power tap and Reactor controller. A box needs to be built using steel casing on the corners, top and bottom, Iskallium blocks in the center and Iskallium glass on the sides. The reactor will output 160 rf/t per every Iskallium block inside. I suggest waiting to try the new update we're working on, it's a huge change and we're working on changing balance. Thanks! Hi! I'm running version 0.5.16 for 1.12.2 and had a server crash when I put a normal leadstone fluxduct on the power tap. Anyone know if this mod is being updated or maintained at all? Anyone know what is best y lvl for this stuff? I have dug tunnels all over Y level 11 and havent found single ore. Fix the world corruption when connecting anything other than an ender IO conduit, you are a complete moron if you miss something you openly mentioned in the first version of the mod. So, I have checked, you released this mod in 2017, this bug has been in the mod for over a year now. Why? have you made an issue ticket on github? I hope this mod will be updated to newer versions. why are the steel blocks from IR not in the oreDict? it makes it pretty much impossible to craft the controller when Unidict is installed. 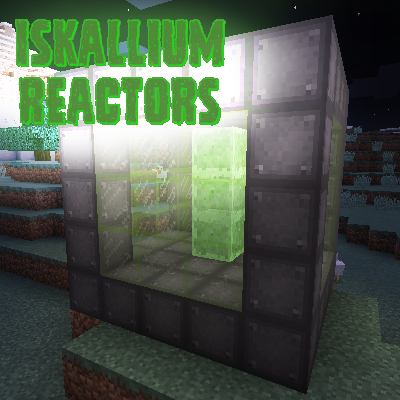 Anyway you can also make an iskallium ingot/ingot block and have it be placeable inside of the reactor? XNet connector (MCJty=autor, mods=RFTools, XNet) seems to fit to power tap but does not extract energy. Edit: Just installed tiny reactors because the conduit / cable worked in the past. Does not work either. Edit: In Creative, it works. Does the size matter? The not-working reactor is sized 8 x 5 x 5. Jun 16, 2018 Edit: I uninstalled Tiny Reactors again (because of severe lag) and dismantled the Iskallum Reactor. I went to another chunk and built it up again. Now it works. Jul 1, 2018 Edit: Added some more Iskallium blocks, moved the controller 1 down so now its one left one down from the tap - it works again. Why? And before: Why not? It is the same structur always. I watched your video and do it like that since then. Sometimes it works, sometimes it doesn't. Moving everything to another chunk helps sometimes, not always. I also check that the whole structure is placed into only one single chunk. But the same structure sometimes works and sometimes fails. The video explains very well what the do and don'ts are. I like the mod because of the slow progression when finding another little amount of iskallium. And I have a 50% chance that it works right away from the start. Fair enough. No, you have to use the steel block from this mod. The steel blocks from other mods overwrites the steel block for this mod even though the steel is oredict. Maybe you can rename the block in reactor casing and change the recipe slightly? Renaming the block with changing its ID will not effect existing reactors. This would fit better with other mods. Normally the most tech mods make also a bit more difficult to get steel. Iskallium Reactors has a simple recipe for that. The changes would it fit better with other mods.